Are you wondering how to stay warm while camping in a tent? …and what you’re about to learn – in order to brave the cold outdoors. Read on to discover exactly how to achieve maximum toastyness! Camping in the cold has it’s perks— the best campsites are finally up for grabs, there are fewer people, and annoying summer insects (I’m looking at you mosquitoes) retire for the winter. 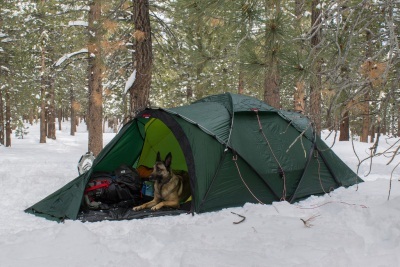 Even though these tips will keep you toasty on your next winter outing, they are applicable to camping in every season, because sometimes camping in the high sierras in the dead of summer proves to be just as frigid as a winter night in the high desert. 4 4) Insulate, Insulate, Insulate! Yeah, I’m all for skimping while camping (aka sleeping without pads and eating uncooked ramen). But skimping on insulation in the winter is a major no-no. First of all, you need to bring a good cold weather rated mummy sleeping bag that is rated for zero degrees, and if you are expecting arctic conditions, opt for a -40 to 4 degree down sleeping bag. You are also going to want to bring a closed-cell foam pad to put beneath your regular cushy sleeping pad for extra insulation between you and the ground. Also, some people say that doing a few quick sit ups in your sleeping bag can really kick start your body’s heat production and send you sailing right off to sleep. When you are winter camping, the snow you sleep on top of often melts, refreezes and creates strange uncomfortable bumps and grooves. Thus, you should try to clear out all the snow beneath your sleep area, so you are sleeping on good ol’ reliable dirt instead. If it is too thick and icy, then create a trough that is just the size of your sleeping pad. If you are just camping on plain old cold dirt just make sure to clear out rocks and debris, so you don’t end up in a princess and the pea sort of situation. Forget about that tapered waistline! If you want to keep toasty during cold nights you should indulge in a midnight snack before you hit the sleeping sack. Eating slow digesting and calorie-dense foods like chocolate, cheese, and nuts work well to keep your body working and generating heat throughout the night. Also, stay properly hydrated because your digestion will work better if it has enough water to digest your food. You know that those emergency blankets are great for more than, well, emergencies? They are great quick fix insulators and tent warmers. Just attach the thermal blanket to the ceiling of your tent with duct tape and it will reflect much of the heat inside the tent back down at you. Also, you can use a tarp, leaves, and sticks to turn your tent into a little heat fortress. If you haven’t insulated a tent DIY style before, this video will walk you through it. In the video you’ll learn to to tuck the tarp up into the tent and jam sticks into the ground to hold it into place. To minimize airflow, push leaves and debris against the side of the tent for some auxiliary insulation, especially in the sides, crevices and gaps where the poles come down. However, if you want something easy peasy, then just get yourself an indoor-safe portable warmer. These things can really increase your comfort level and they’re extremely easy to use. Here’s a great one: Mr. Heater F232000 Indoor-Safe Portable Radiant Heater. Most people don’t realize that you need to keep your tent ventilated at night, because if you don’t all that trapped moisture from your breath will condense and rain back down on you during the night. So just make sure to open up a few of those ventilation flaps for sweat and body heat to escape through. Also it is vital that you keep yourself from sweating. Wear dry base layers (merino wool sweater, shirt, pants, socks, liners, gloves and a hat). But also make sure the clothes aren’t too tight since that restricts blood flow and the distribution of heat within your body. So you should definitely wear a knit hat while you sleep. An uncomfortable amount of body heat escapes through your head during the night simply because your head often pops out of the sleeping bag and becomes exposed to the cold. Also, if you wear one you will be far less tempted to duck your head inside your sleeping bag because when you do that your breath creates condensation inside the bag which can ultimately make you colder throughout the night. As you know, beanies often slide off while you sleep, so I recommend a hat like this one that has tassel braids you can tie together beneath your chin (I know it’s gonna look dorky, but the warmth and a hassle free hold is worth looking uncool right?). Now you know exactly how to stay warm while camping in a tent. If you follow these 6 tips and tricks I promise you’ll be equipped to camp in frigid conditions, unless you are camping in the arctic circle (which I cannot endorse). So get out there, carve yourself a good snow sleeping trough, and have fun!